CLLCTIVLY.org is a social impact organization in Baltimore, Maryland that serves as a resource for those seeking to find, fund and partner with Black social change organizations in the Greater Baltimore community. Founded by Jamye Wooten, CLLCTIVLY seeks to foster collaboration, increase social impact and amplify the voices of local Black-led organizations. Baltimore, MD, January 17, 2019 --(PR.com)-- Individuals and organizations can apply for the grant at www.BlackFuturesGrant.org by January 31, 2019. Building Black Futures Together is their motto. 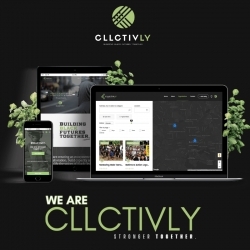 CLLCTIVLY.org, a community-basedorganization in Baltimore, Maryland is spearheading an effort to show the tremendous impact Black lives are having throughout the Baltimore community. Each month, CLLCTIVLY.org will award a local individual or organization with a BLACK FUTURES MICRO-GRANT - a no-strings-attached $1,000 grant for changemakers serving Greater Baltimore. The deadline for the first submission period is January 31st, followed by a two-week, community-wide voting period. The Award and $1,000 check will be presented on February 22, 2019. For more details, visit BlackFuturesGrant.org. “CLLCTIVLY.org is very excited to offer the Black Futures Micro-Grant. Baltimore has amazing, dedicated individuals and organizations in our community who are making a difference without a spotlight, and often under resourced. We want to show our appreciation and motivate others to also use their time, talent and resources to strengthen our communities,” states Jamye Wooten, the founder of CLLCTIVLY.org. Wooten hopes that CLLCTIVLY will help bring unity and foster collaboration among the many community organizations doing great work, but often working in silos. “Community-based organizations often work in silos. Silos lead to fragmentation and fragmentation leads to duplication and wasted resources - such as time, talent and treasure,” says Wooten. If the organization’s first month is any indication, the future of CLLCTIVLY is bright. “Members are joining, the Black Futures online store is fulfilling orders and the first Black Futures Micro-Grant Award is just weeks away. The community is responding, and we’re excited about it,” shares Wooten. CLLCTIVLY.org is a social impact organization in Baltimore, Maryland that serves as a resource for those seeking to find, fund and partner with Black social change organizations in the Greater Baltimore community. Founded by Jamye Wooten, CLLCTIVLY seeks to foster collaboration, increase social impact and amplify the voices of local Black-led organizations. CLLCTIVLY uses a decentralized leadership model with an asset-based framework rooted in interlocking principles (#mlk2baker) to encourage community engagement that goes #BeyondREactivism, toward wholistic community-building rooted in shared principles and a common framework to yield sustainable solutions. To join CLLCTIVLY, apply for the Black FuturesMicro-Grant or shop at the Black Futures online store, visit www.CLLCTIVLY.org.